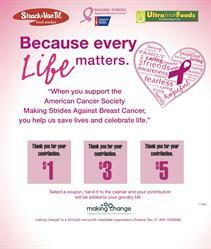 CHICAGO, IL--(Marketwired - September 28, 2016) - During the month of October, Strack and Van Til and Ultra Foods are partnering with nonprofit organization making change® on 'Because Every Life Matters' breast cancer awareness point-of-purchase fundraiser benefiting the American Cancer Society's Making Strides Against Breast Cancer. 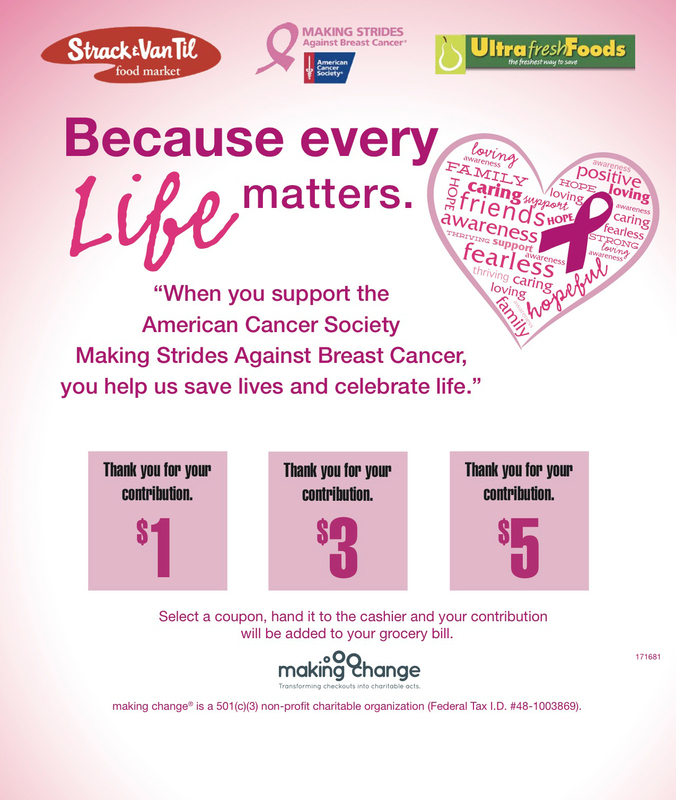 The campaign features pink boards stocked with $1, $3 and $5 donation coupons and will appear at checkout stands at the Strack and Van Til Riverfront Plaza location and all 11 Chicago-area Ultra Foods stores. Customers donate by selecting a coupon in the desired denomination and handing it to the cashier to be scanned. The donation amount appears on the final bill and is 100 percent tax-deductible. "Programs during Breast Cancer Awareness Month bring significant awareness to the devastating effects of this horrible disease, while also raising funds to support research and critical programs," said Emily Lipinsky, senior manager, American Cancer Society. "Campaigns like making change's 'Because Every Life Matters,' offer individuals easy ways to support the cause while going about their day-to-day lives. We are thrilled to have them and each of the 12 area grocery stores as supporters." "Strack and Van Til is pleased to continue its partnership with making change® for our 'Because Every Life Matters' campaign," said Chris Bengtson, vice president, public relations and community affairs, Strack & Van Til and Ultra Foods. "The fundraiser offers our customers a simple way to help make a difference and show support of this hugely important cause throughout October." "Breast cancer has affected so many lives," said David McConnell, president and CEO, making change. "We applaud the programs and services offered by the American Cancer Society and are delighted to help bring together the organziation and the participating grocery stores to help raise much needed funds." The American Cancer Society® is a global grassroots force of more than 2.5 million volunteers saving lives and fighting for every birthday threatened by every cancer in every community. As the largest voluntary health organization, the Society's efforts have contributed to a 20 percent decline in cancer death rates in the U.S. since 1991, and a 50 percent drop in smoking rates. Thanks in part to our progress nearly 14 million Americans who have had cancer and countless more who have avoided it will celebrate more birthdays this year. We're determined to finish the fight against cancer. We're finding cures as the nation's largest private, not-for-profit investor in cancer research, ensuring people facing cancer have the help they need and continuing the fight for access to quality health care, lifesaving screenings, clean air, and more. For more information, to get help, or to join the fight, call us anytime, day or night, at 1-800-227-2345 or visit cancer.org. SVT, LLC. is a grocery retailer focused on providing high-quality products in a unique and inviting atmosphere with a high level of customer service. The company currently operates 37 stores in Illinois and Indiana under the banner names Strack and Van Til, Ultra Foods and Town and Country Market. SVT, LLC is an equal opportunity employer. For more information about Strack and Van Til, please contact Chris Bengtson, vice president of public relations at 219-237-5027 or by email at BengtsonC@s-vt.com. For more information, visit www.strackandvantil.com, www.ultra-foods.com. making change® is a 501(c)(3) charitable organization that partners with thousands of retailers nationwide to run point-of-purchase fundraisers. Since 1985, the organization has successfully raised more than $100 million to fund non-profit organizations in the United States and around the world. For more information, visit www.makingchange.org.